I'm still wishing our bedroom was a little softer and cozier....like this one by Anne Hepfer. I love the fluffy white pillows and the upholstered headboard. And I think what I like most is that shade of green that envelopes the room...I guess it's sage? The complete package of this room is just so serene and comfy and clean. I also always love when lighting is incorporated in a bed canopy like this...they seem like magic floating fixtures. I would change one thing, though...I would switch out the throw for a lavender one! Bring in just one colorful item to break up the green. Do you like anything in particular about this bedroom? I love the room too! I totally agree with the lavender throw-great idea! 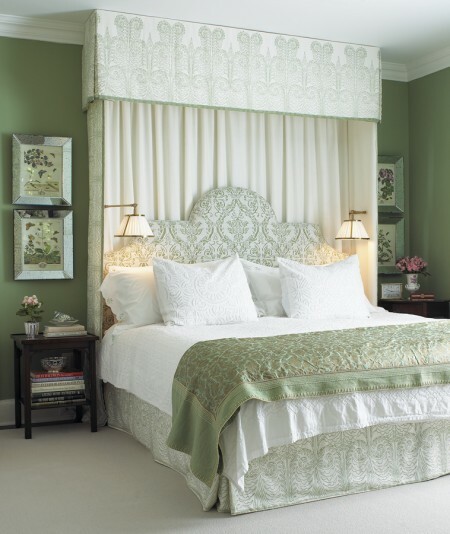 That half canopy is just beautiful - what a soft, delicate room. I am nuts for canopies and coronets. The more fabric the better. I love all of the white linens. I love the headboard and I would love to see a lavender throw.